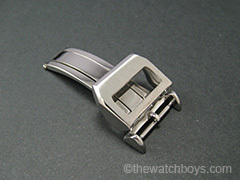 IWC Style Deployant Buckles [twb_iwc_deployantbuckle] - $39.95 : The Watch Boys, Providing quality products for watch collectors! No logo, but big savings. Preserve your OEM buckle. Made to OEM specifications, to fit your IWC DEPLOYANT STYLE watch straps, ONLY. Or any other watch brand variation with the extra long long end and the shorter short end.